Call today for an auto insurance quote! Are you looking for the right health insurance policy in Charleston, SC? Why not contact an insurance firm that you can trust to show you dedicated, personalized attention? C2G Capital Management LLC is here to help. We are an insurance and financial services company devoted to finding each client the auto insurance or home owners insurance policy to best suit their needs. C2G Capital Management LLC is your one-stop shopping for all your professional financial services requirements in Charleston, SC. At our firm we specialize in "Helping People Make Smart Choices About Their Money." We can assist our clients with all kinds of home owners insurance; including auto insurance! We offer banking and mortgages services as well as financial planning and asset management services. We also offer our clients home owners insurance and health insurance options! It's important to trust your insurance and financial services company. That's why you should choose an agency that will work hard to give you the coverage you need at the rates you deserve. From auto insurance to health insurance, C2G Capital Management LLC is your source for all kinds of financial services, including insurance and mortgages. Our home owners insurance policies are sure to grant you peace of mind. When you contact C2G, you know that you're dealing with one of the most trusted insurance and financial planning companies in Charleston, SC. From auto insurance to health insurance, home owners insurance, motorcycle insurance, and more, our policies are sure to meet your needs. Contact us for health insurance in Charleston, SC! C2G Capital Management LLC is the Charleston, SC area's trusted source for everything from home owner's insurance to health insurance or even auto insurance. Our experts are up-to-date with the options available today, and we will help you find the right policy to meet your needs and those of your family. As the one of the premier Surety Bond agencies in South Carolina we specialize in ERISA, Fiduciary, Court, Construction, Residential Builders, Brokers and a host of other Federal and State required surety bonds. Our carriers meet Department of Treasury qualifications for Bid, Performance and Payment bonds for Federal contracting acquisitions. Our Investment management vision is unique. We believe that less is more. In other words, we believe in dedicating our time to serving a few clients rather than trying to expand for the sake of expanding. We want to make sure that each one of our clients receives the best service possible. We determine a mutual fit with our prospective clients before embarking on a lengthy Trusted Advisor Relationship and deciding to perform Asset Management for them. This is done through a process called Values-Based Financial Planning and the development of a Financial Road Map®. We do however offer to consult with anyone on an hourly basis as our investment and financial planning services are strictly fee only (no commissions). 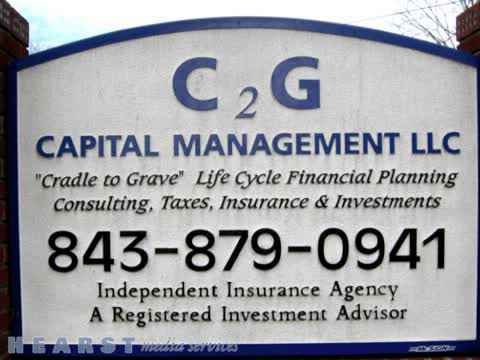 C2G Capital Management is your trusted source for auto, home, or health insurance policies in Charleston, SC. Our policies are affordable, trustworthy, and comprehensive. Give us a call to learn more! Do you think you are paying too much for auto insurance? Or maybe the new health insurance reform has you worried, and thinking about changing policies? Well it never hurts to call an insurance provider and request new quotes. You can give C2G Capital Management LLC call today and we will be more than happy to provide you with a free quote for any of your insurance needs (843) 879-0941! We offer affordable health insurance and home owners insurance to our clients! Have you been looking for a consulting firm to help with your total financial planning? Contact C2G Capital Management LLC! We can help to plan for families, businesses, executives, and even military and government personnel! We proudly serve Charleston, SC and the surrounding areas. We even offer our services for people outside of South Carolina! Call today and find out if we can be of service to you! Finding the right health insurance, auto insurance, or home owners insurance policy is of the utmost importance. Making sure that you, your family, and your assets are protected in case of disaster can lend invalueable peace of mind. At the same time, it's important to choose the right policy. Does the package you have chosen meet your needs and the needs of your family? Is it an affordable price? You want to work with people who are interested in you as an individual, not just collecting a bill. Choose the firm that understands how important it is for you to be able to enjoy your life. Choose Capital Management LLC. Your home might be your greatest financial asset, and C2G Capital Management LLC wants to help you protect it in the Charleston, SC area. Home owners insurance is a form of property insurance designed to protect an individual's home against damages to the house itself, or to possessions in the home. Home owners insurance also provides liability coverage against accidents in the home or on the property. For those perils that are not covered, there may be supplemental insurance you can purchase as well. At C2G Capital Management LLC, we know that our client's time is of the utmost importance to them. Realizing this critical life point, we want to free up time for the things in their lives that are really important to them. Life can be broken down into various health factors: physical, mental, relationship, career, spiritual and financial. Since our clients have entrusted their financial health to us, they can focus on the other health factors for which they cannot delegate. As such we teamed up with some of the top professionals in each of those other key health factors to write inspiring articles to help our clients live more fulfilled lives with a greater sense of purpose. You can purchase an annual subscription of 12 monthly newsletters for $69.00 or become one of our select members we call ideal clients and get them as an integral part of our services. Give us a Call for Auto Insurance! Have you recently purchased a new car, or are you planning to anytime soon? While owning a new vehicle is great, it is also your responsibility to protect your vehicle and yourself with quality auto insurance. Our professionals at C2G Capital Management LLC can make sure you have the right auto insurance policy for the right price. If you live in Charleston, SC, be sure to contact our company for help with your insurance. At C2G Capital Management LLC, we specialize in helping people make smart choices about their money! We are proud to serve Charleston, SC and surrounding areas! Whether you are in need of auto insurance or health insurance, we are ready to help. Contact us today! We offer a variety of types of insurance. When you choose us, rest assured that we can help you be prepared for anything: Annuities, Life, Health insurance, Disability, Long Term Care, Fire, Home, Auto insurance, Boat, Yacht, Jet Ski, RV, Motorcycle, ATV, Camper, Business, General Liability, E&O, Officers and Directors, Home Owners Associations and home owners insurance, Renters, Weddings, Worker's Compensation, Property & Casualty, Bonds, Surety Bonds, International Travel & Health. Do you need help with taxes? We offer consultation and tax preparation services for both individuals and small businesses. We also help with your needs! We can help you with CD's, checking accounts, savings accounts, and more. A minimum of $1500 is required to open a savings account. We also offer ATM and credit cards, including online banking services. Our interest rates are above most other insutitutions, and we are FDIC insured. Need a mortgage? We offer competitive interest rates for those with FICO scores above 670. C2G Capital Management offers financial planning services. We offer comprehensive planning for retirements, estates, college funds, and more. We work towards special goals with plans tailor-made specifically for you based on your dreams and goals. We also offer personalized asset management, in which we will develop, implement, monitor your investments. This service is not available to everyone, a personal meeting with our Wealth Management Consultant is required to determine proper fit and Trusted Advisor relationship. (normal minimum asset requirement is $100,000 may be waiverable with interview). Travelers, Hartford, AIG, Progressive, Midland, Genworth, Blue Cross Blue Shield, Assurant, IMG, Bristol West, Foremost, Safeco, Zurich, Infinity, GAINSCO, Assurance America, Universal, Capitol Preferred, Capitol Indemity, Great American, American General, Lincoln, Ameritas, Omni, Nationwide....and much more.